Prepare yourself and 7 friends for an adventure on board the USS Hornet, moored at Pier 3, Alameda Point, in Alameda, California. The Captain’s Tour covers much of the historic ship and includes a catered lunch in the Admiral's wardroom with a presentation of the history of the Hornet. The tour will be conducted by US Navy Veterans. They will explain many aspects of life on a navy ship, discuss naval operations during the service life of the Hornet, and describe the functions of the areas and many compartments visited during the approximately five hours experience. 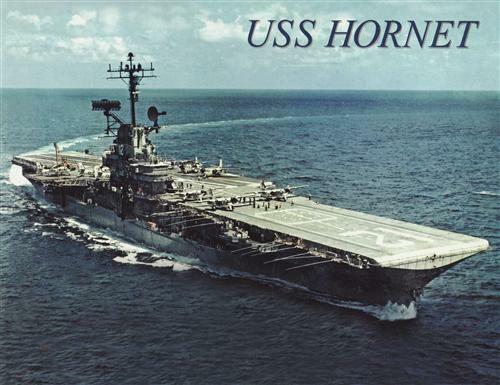 The Hornet is almost 900 feet long and has 18 levels or decks, of which you will visit 13. You will go into dozens of different compartments large and small whose functions cover everything from the mundane food preparation areas to the massive engine and fire rooms to the command and control spaces such as Combat Information Center and the Captain’s bridge. You will learn everything from how to catapult a plane off the deck to discovering the complexities of the steam-driven propulsion system. This is a once in a lifetime experience and can only be won at our "Evening of Sparkles" event. Be sure to purchase your ticket today.